The Deacons at Highland Baptist Church are servant leaders who strive to minister to the spiritual and physical needs of the congregation in cooperation with the ministry staff. Our Deacon body is comprised of 27 men and women from all walks of life that serve for a three-year term before rotating off the active roster. Deacons are nominated by the church body, and elections are held annually in the fall. Monthly meetings include times of prayer, discussion of appropriate pastoral care needs, decision-making, and times of fellowship. 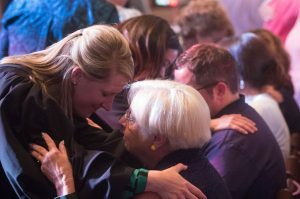 Our Deacons are divided into servant groups, where they care for our new members, homebound members, and the day-to-day pastoral care needs of the community. They also participate in worship by serving the Lord’s Supper, receiving the offering, and greeting visitors and members. For the 2017-2018 church year, our Deacon Chair is Vicki Runnion, and our Deacon Vice Chair is Kim Shippey.